For the first time ever, U.S. automakers are getting ready to sell small cars that go beyond adequate to potentially great. Certainly the styling, specification, and safety equipment of upcoming compacts and subcompacts is a giant step above their predecessors. The latest example is the 2011 Chevrolet Cruze, the compact four-door sedan that Chevy will officially unveil this week at the Los Angeles Auto Show. It replaces the aging and uncompetitive Chevrolet Cobalt, which we named one of our least favorite green cars. The Cruze is based on a car already sold throughout Asia and Europe, with added safety and emissions equipment for the U.S. market. It should give Chevy a viable entry in the crucial--and competitive--compact arena, facing off against the Toyota Corolla, Honda Civic, Nissan Sentra, Hyundai Elantra, and soon, the all-new 2012 Ford Focus. 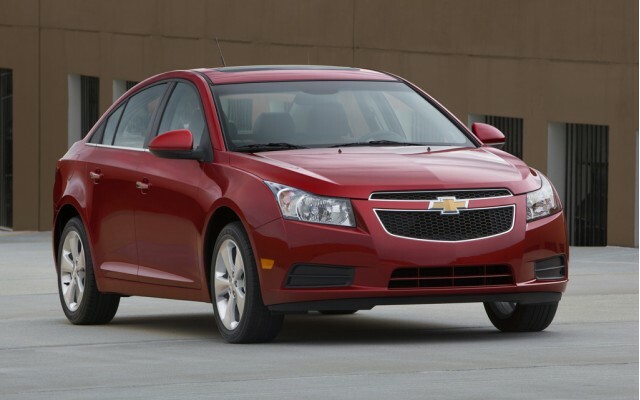 The 2011 Chevy Cruze will offer two four-cylinder engines, one with a turbocharger, and a choice of six-speed automatic and manual transmissions. The base engine, forgoing the turbo, is a 1.8-liter four rated at 136 horsepower and 123 pound-feet of torque. The optional Ecotec turbocharged engine is smaller, at 1.4 liters, but more powerful: 138 horsepower and a much beefier 148 pound-feet of torque. The EPA hasn't yet rated the 2011 Cruze, but the 1.4-liter turbo engine may return as much as 40 miles per gallon in the EPA highway cycle. With a larger 2.2-liter engine, the EPA rated the base model of the old Cobalt at 25 mpg city / 37 mpg highway. Electric power steering, an increasingly common feature, also helps save fuel by eliminating the constant and power-sapping engine load of a hydraulic steering pump. 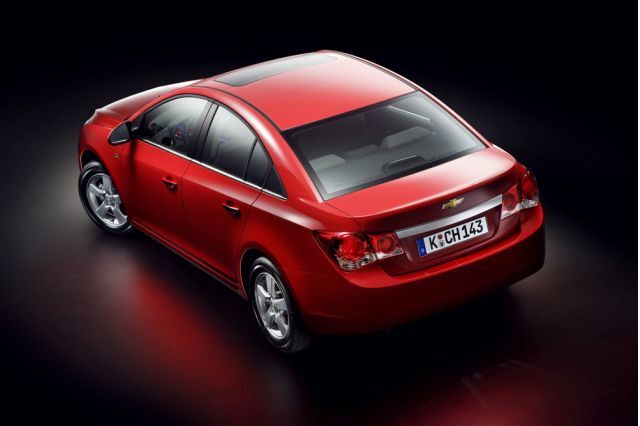 Chevrolet has put enormous effort into making the 2011 Cruze competitive in every measure: quality, equipment, refinement, and attention to detail. Its two-tone interior, for instance, is unique among the often-drab black or gray surroundings of some compacts. 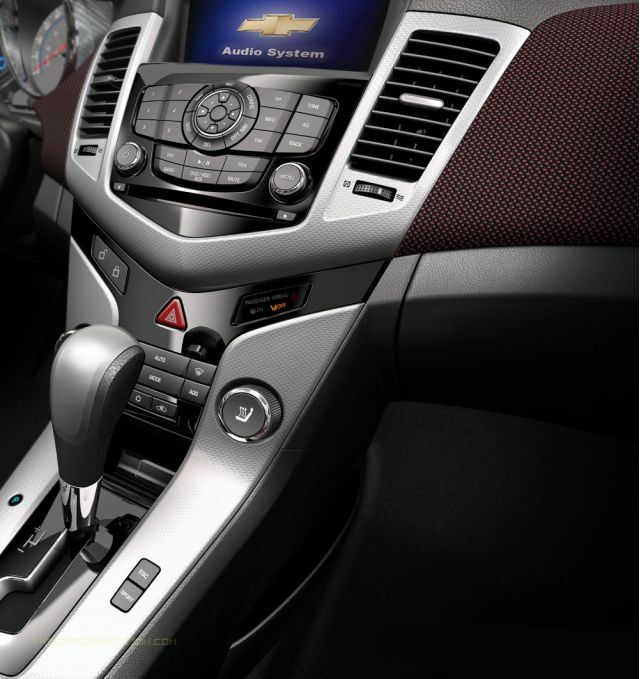 And the 2011 Chevrolet Cruze provides a remarkable (and class-leading) 10 air bags as standard: driver and passenger front and side bags, rear seat side air bags, roof rail head curtains, and new front knee air bags as well. Continuing on the safety theme, the Cruze also fits StabiliTrak electronic stability control with rollover mitigation as standard, along with traction control and anti-lock brakes. Chevy's press materials stress that GM has learned its lesson: Consumers want big-car features and "a lot of content" even in smaller vehicles. The standard stereo, for instance, has six speakers and an auxiliary input jack for MP3 players. There will be three trim levels: LS, LT and LTZ. The 1.4-liter turbo engine will be standard on LT and LTZ models. Options include a premium Pioneer sound system, a navigation system, Bluetooth compatibility, and that USB port "for iPod integration." 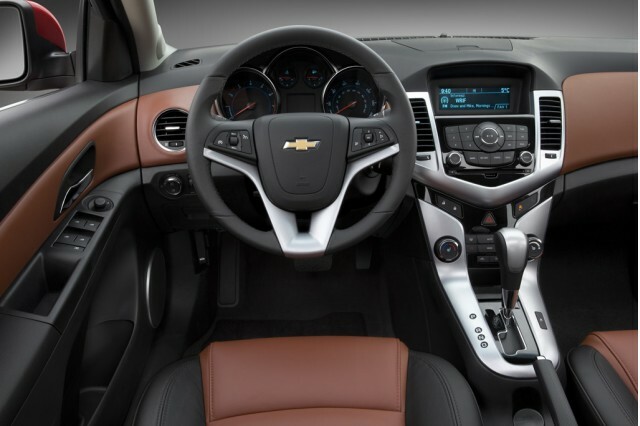 At the top of the range, buyers can order a 2011 Chevrolet Cruze with heated leather front seats, XM Satellite Radio, OnStar, Bluetooth, cruise control, power locks and outside mirrors, and 16-inch aluminum wheels. Chevy promises the price for that model will be "very competitive," which we expect to mean a few hundred dollars less than a comparably equipped Asian compact. 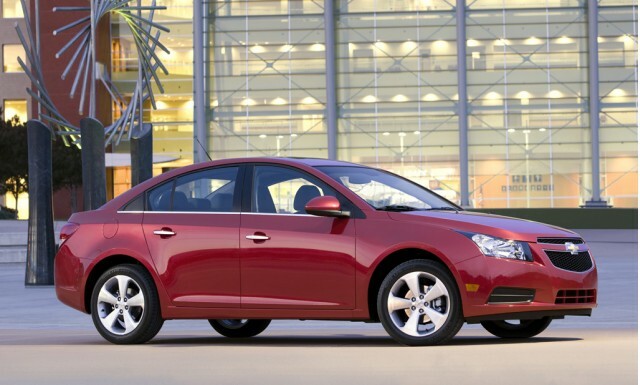 The 2011 Chevrolet Cruze will arrive at Chevy dealers between July and September next year. It will be built in the Lordstown, Ohio, plant built to launch a much earlier--and disastrous--GM compact: the 1971 Chevrolet Vega. Final pricing for the 2011 Cruze won't be announced for a few months, but the base price is expected to be comfortably under $20,000.